Tuesday night was very busy. I was garbage picking in a fairly wealthy neighbourhood and it seemed like there was always more interesting trash just around the corner. This pile sat in front of a recently sold house. The residents don’t seem to be putting any effort into redistributing their old stuff; the week before they put out bags and bags full of kids toys (how many do kids need, really?). 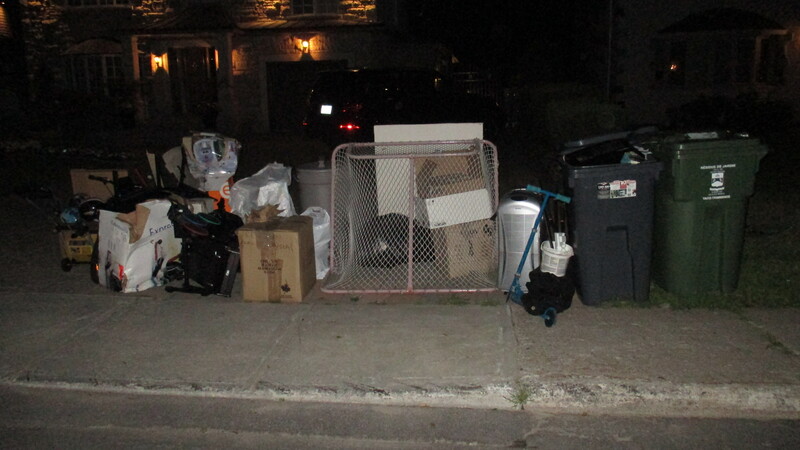 This time around there was lots more on the curb, including a fine looking hockey net, a scooter, a kids’ bike that needed some work, and a Danby portable air conditioner. I didn’t take much, partly due to lack of space in the car and partly because I need to maintain my sanity. In retrospect though I wish I took that air conditioner, which you can see next to the bins on the right. 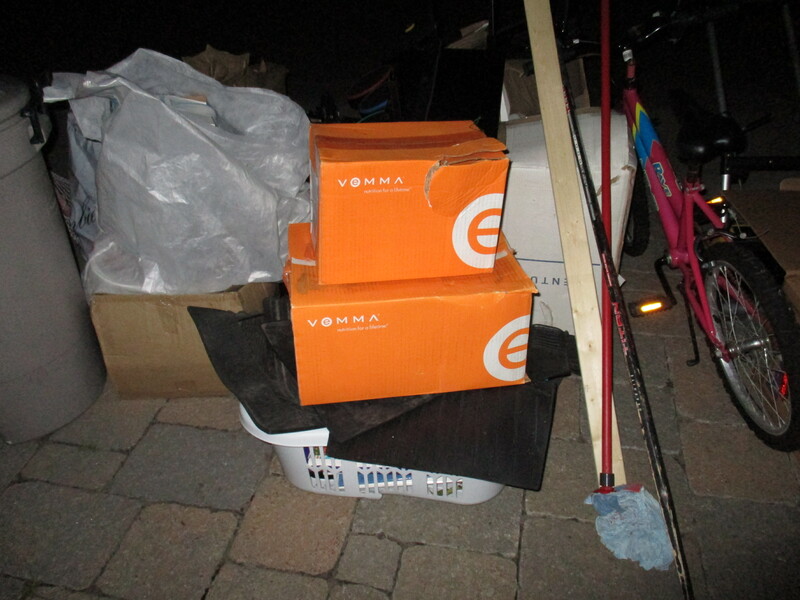 In the back were two cases full of a drink called Vemma. I left them behind because they expired in 2014 and also because I mistakenly read the name as Vomma, which doesn’t sound appetizing at all. I looked at the company website, curious as to what the drinks were and how much they would have cost. The website felt a little weird and I got a little suspicious. I did some more research and sure enough many experts consider Vemma to be a pyramid scheme. All this product would have cost well over 100$, and it’s really not any better than your average (and much cheaper) multivitamin. This person, like many others before them likely found out the hard way that unloading this overpriced drink is more difficult that it seems. The one thing I did take home from this pile was a Bissell Little Green steam cleaner. It works great and looks like it’s been used only once or twice. 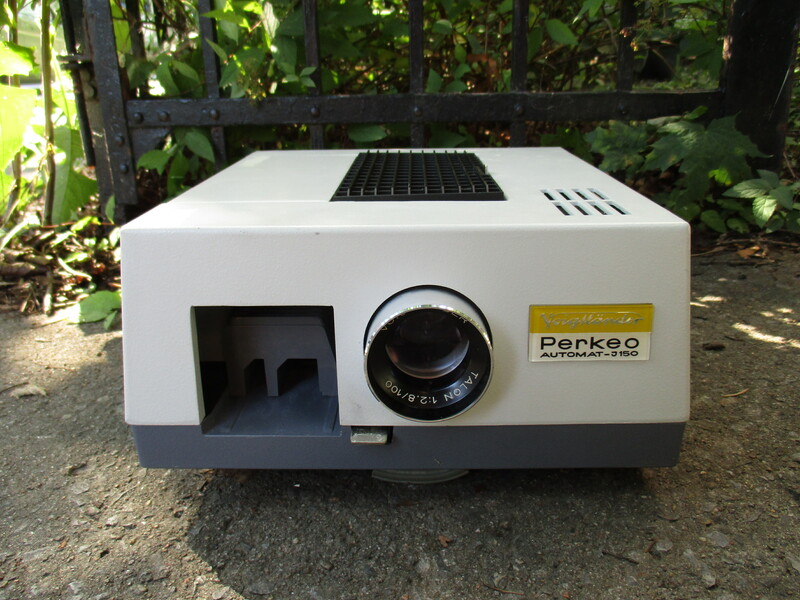 These sell for over 100$ on eBay, though I’ll likely keep it myself as it’s a useful thing to have around the house. This spot provided a few more nice finds. The bag was full of miscellaneous camera accessories, none of which looked to be particularly valuable. I brought it home just in case I missed something valuable – a nice camera lens can be worth big bucks – but I ended up just leaving it on the curb in front of my house. It didn’t last long out there, and hopefully found a good home. Inside one of the bags was a cool aviator hat. 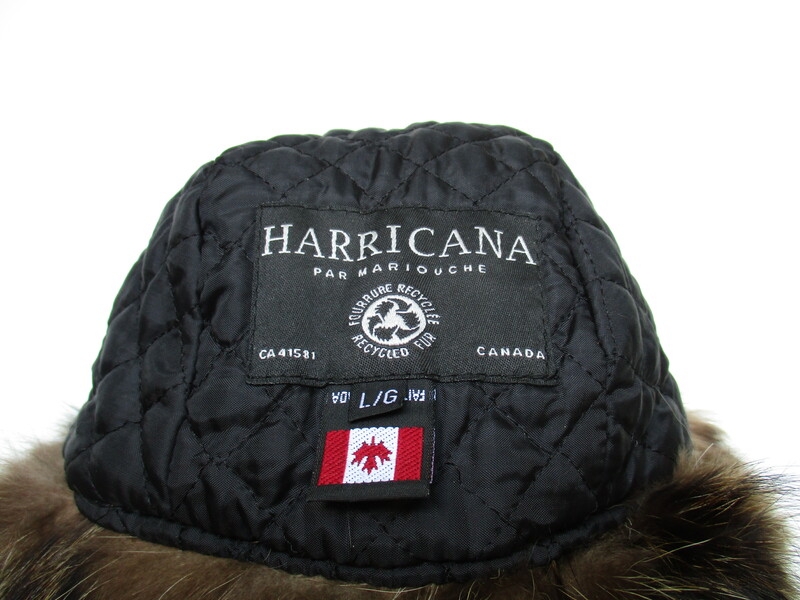 It was made by Harricana par Mariouche, a Montreal-based fashion design company that uses only recycled furs. I’ve actually driven by the headquarters on several occasions (at St. Antoine / Atwater if you’re curious) but had no idea what it was. The hat appears to be totally unused. Maybe it was an unwanted gift or something. 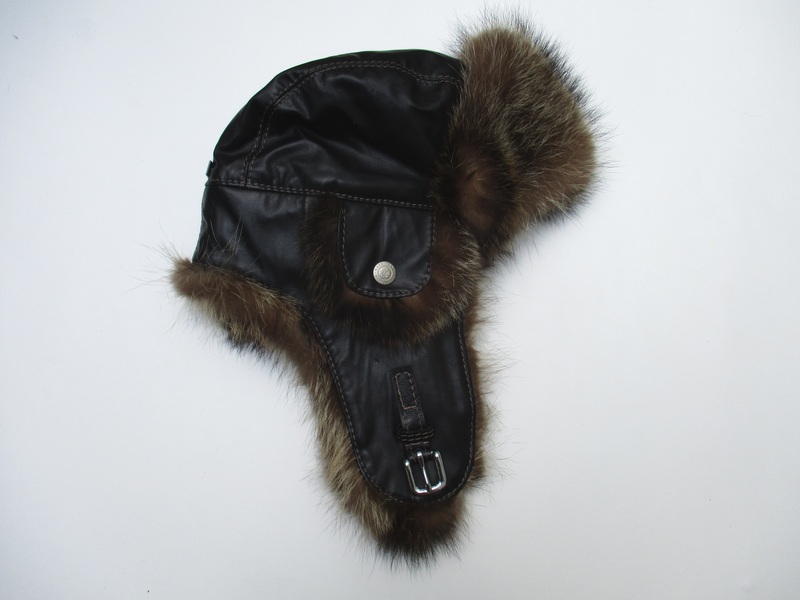 New aviator hats seem to go for close to 300$ while used ones on eBay are going for a little over a hundred. I listed mine for around the going rate, though I don’t expect it’ll sell until the weather starts to cool. On a related note it looks like I can trade in old furs for Harricana par Mariouche gift certificates. I’ll keep that in mind next time I come across some well-worn furs. Readers from Montreal might want to consider this as well. … and five packs of Polaroid film that expired in 1983. I should be able to get decent money for these. I listed the three packs of Polaroid 669 film for 70$ with free shipping , while the two packs of 665 I put up for 160$ . That may seem high, but the 665 film has been discontinued and is apparently very desirable for some photographers. My price is in line with the cost of newer film of the same type. The market may prefer newer film but I won’t know for sure unless I try for that higher price. The going rate for the 669 film is much more clear cut, and I expect it to go for my asking price. I was just about to go home when I came across another big pile in front of a recently sold home. There were two bags just stuffed with DVDs, the vast majority of which are in excellent condition. These people apparently loved Entourage, the Sopranos, Melrose Place, and UFC fighting, the latter two of which are strange bedfellows. I imagine this collection would easily have cost upwards of 500$. 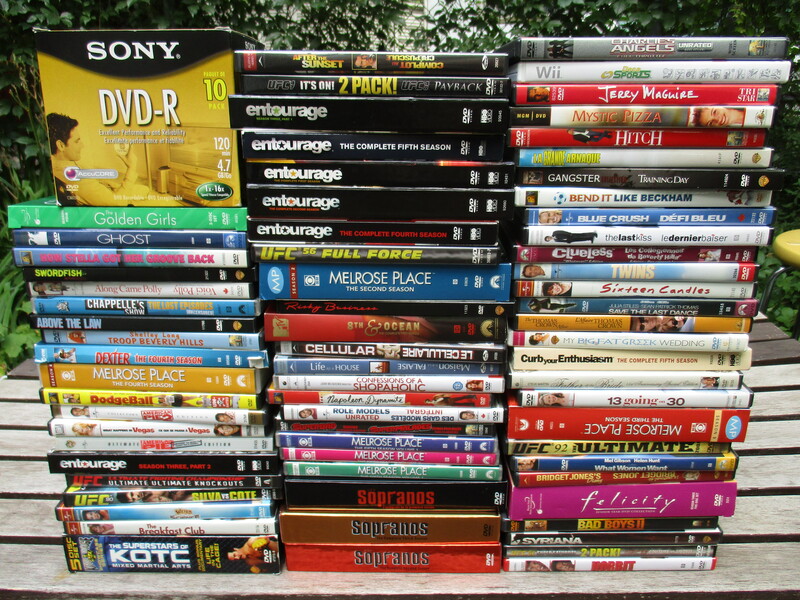 I should be able to sell these DVDs for decent money at my yard sales. 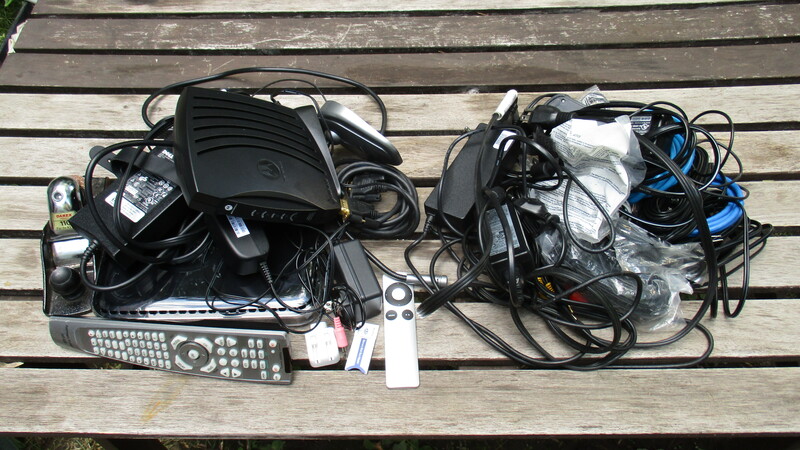 I also found a bunch of wires, cables, adapters, and electronics, including a modem and a router. I hear there’s a place in Park Ex that buys this kind of stuff – I may go there and see what they offer me. Some items will definitely end up on eBay though, like that remote in the middle that belongs to an Apple TV. I have a good feeling about this week! I’ll keep you posted as usual. You found some good stuff! Throwing out a hockey net. So wrong in Montreal! I recently discovered your blog and I LOVE it!!! After 2 days of reading, I am addicted to the point that I was trying to figure out how to vacation where you live and watch you work. (However, living in the very middle of the US makes that a bit unrealistic) I’m glad you love what you do and I really appreciate all the research you do to provide history for your found items. I have done some “dumpster diving” and have found pretty good things that way, but never sterling silver jewelry, money, or anything like that! Maybe I need to go to the really nice areas of town and start looking. Around my town, there are 4-5 thrift shops so people donate their unwanted items there instead of throwing them away. Glad you like the blog! I would keep an eye on those rich neighbourhoods for sure, they definitely toss out more great stuff than the average folk. 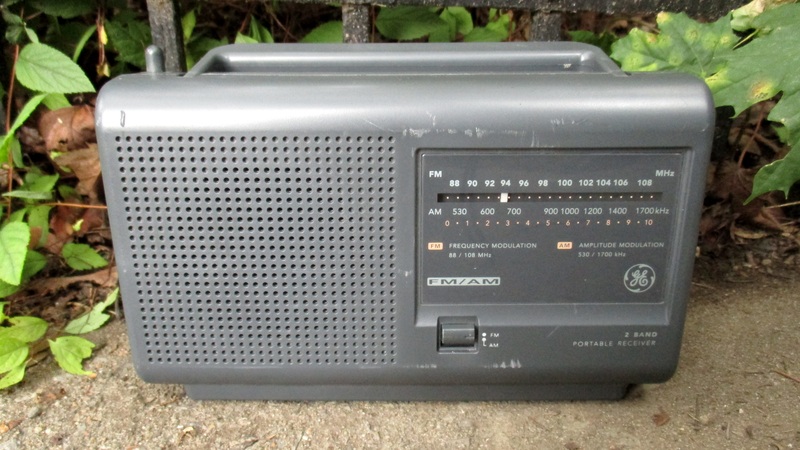 What is the deal with chucking this kind of stuff in the garbage, stuff that can surely find a home, even if it’s in a “Take me, it’s free!” box?? Man, that really angers me. I hear you. Some people just don’t care. I think once a person is sheltered from financial hardship for a long time they can forget that others are struggling just to get by. Seriously, there are many kids in this city that would have loved to have that hockey net by itself. Unfortunately, even beyond my garbage fatigue there was no way I would have been able to fit it in the car. We can only hope a scrap metal collector came by and found it. I’d keep that steamer too! I have one of those Bissels as well and it has been a godsend, especially with kids and pets. I love that little machine! As you know, I’m going through my own bout of garbage fatigue, but I don’t think I would have been able to resist all that stuff. The firsts of the month are here for me, so even thought I really don’t have the room right now, and my house is in chaos from renovations, I still can’t help going out trying to save as much as I can from the landfill. 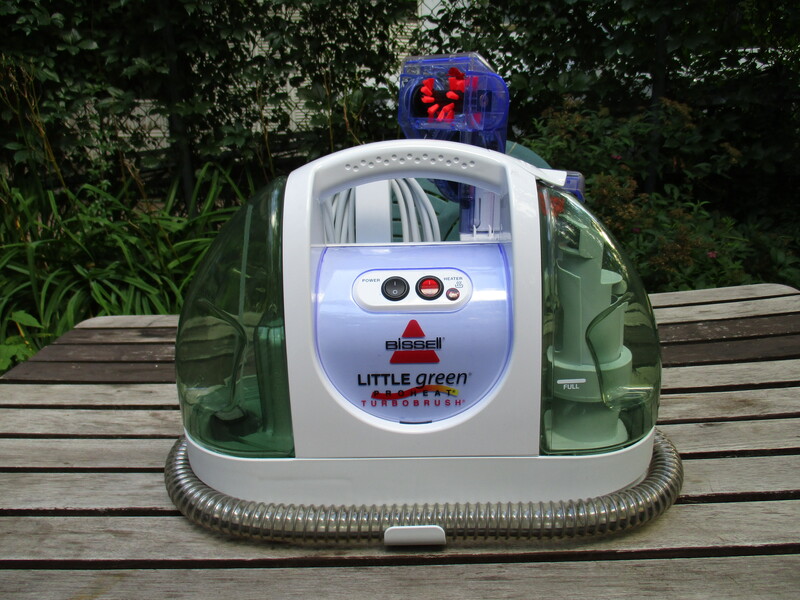 I love the Bissell too… I’m going to use it to clean up the car! My passion for history is a large part of what drives my trash picking, so I have a relatively easy time passing up newer stuff (and have a harder time passing up on vintage stuff, even if it’s not worth any money). I can become blind to the new stuff though, which sometimes mean I pass up on easily flippable items that are right in front of me (like that air conditioner that probably worked fine). Either way, I definitely wasn’t fitting that hockey net or that old bike in my small car, and I’ve long given up trying to do anything with kids toys. Interesting week for you. You really have to wonder about people who throw out so much good stuff. 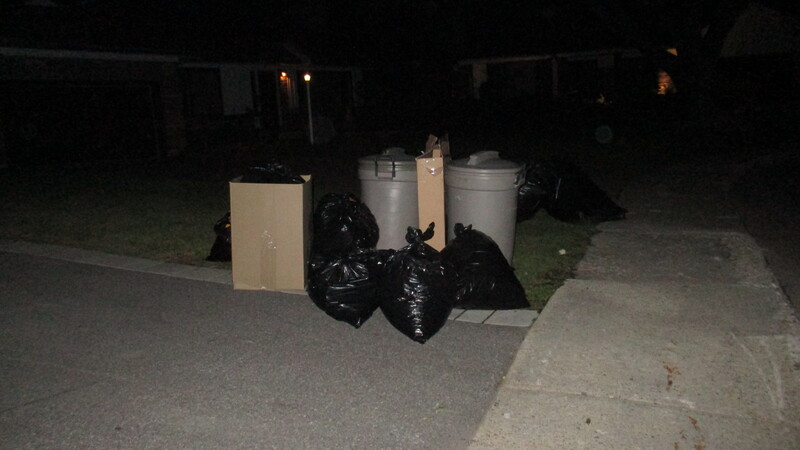 You should get over your garbage fatigue.In winter and after September,you will find less good stuff in the trash. Easier said than done. 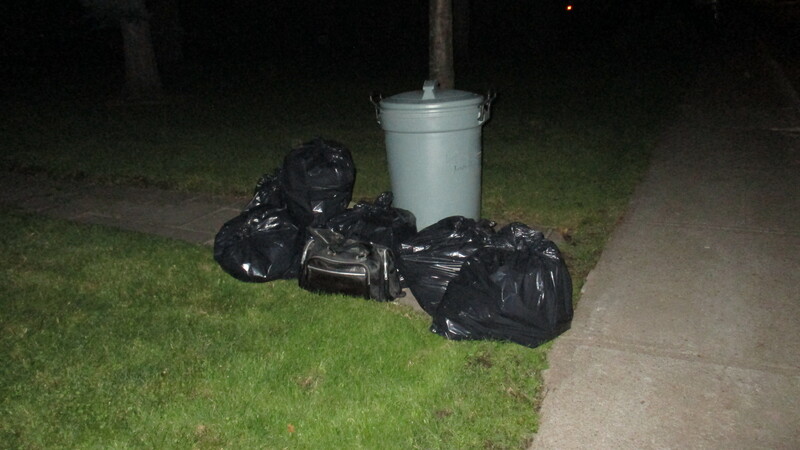 And you’d be surprised how much there is in the winter… the garbage never stops. Agh! I can’t believe they threw away a Harricana! This is such nonsense. They’re great pieces though, I’m sure you can get a good buck out of it, and she is an incredible designer which I respect a lot. I’m glad you could save it from that pitiful end! It seems to be pretty well made. I might have kept it for myself if I had more money. Alas, on my budget a toque would do. I’m glad I saved it regardless.